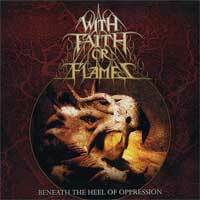 With Faith or Flames isn't what you'd expect of a metal band hailing from Chattanooga, TN. Their sound can only be described as 'Metal'; From their soaring guitar solos and dual harmonies to the thundering double bass and blastbeats, they encapsulate every aspet of the genre. With Faith Or Flames formed in December 2004, released their debut full-length (engineered by Jamie King: BTBAM, Glass Casket, TTIOTD) in December 2005 and began touring nationally in January 2006. Mike Milliken (guitar) was added to the equation in August of 2006 after the departure of Dustin Lane. Mike quit in April 2007 and Trevor DeGaine joined shortly thereafter. With Faith Or Flames is currently writing for their next album, aiming for a Summer 2007 release. With Faith Or Flames is currently unsigned. Band Members Include: Ian Sharp on vocals, Eric Weatherford & Trevor DeGaine on guitar, Eric Collins on bass, and Andrew Core on drums.